In Australia, the name "ugg" is a generic term for sheepskin boots, often worn locally as slippers. In the US, it is a brand - and big business for one company. This has set off an intriguing legal battle, writes Julian Lorkin. Ugg boots have been described as being as Australian as feta is Greek, but few visitors would be aware that the company behind UGG, Deckers Outdoor Corporation, is in fact from the US. The business is determined to stop Australian manufacturers from selling the boots worldwide. It is suing Sydney manufacturer Eddie Oygur for millions of dollars for alleged breach of trademark. "It's outrageous," says Eddie Oygur, founder of Australian Leather, who is in the US for the legal battle. "Ugg is just the name for the boots, and we've sold them for nearly a century. Now a US giant has trademarked the name, and wants to stop us." Traditional Australian uggs were first made in the Blue Mountains in the 1930s to protect against the cold of winter in New South Wales. With the boots now fashionable overseas, legal tussles have begun. It's a battle worth serious money. Revenue at California-based Deckers rose more than 20% to $209m (£161m; A$265m) in the first half of 2017. Deckers registered the trademark UGG in 1999, and has since fought several legal battles with rival manufacturers preventing them from selling the boots in the US. However, courts in Australia have come to the opposite view - ruling that "ugg" is a generic term for boots made from sheepskins with fleece attached. Now, the name ugg cannot be protected in Australia, and anyone is free to sell ugg boots there. 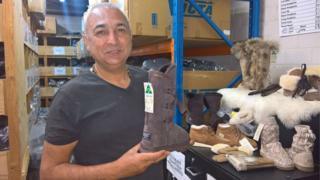 In Lidcombe, a suburb of Sydney, Australian Leather has a workforce of 40, and makes about 50,000 pairs of ugg boots annually using Australian sheepskins. Speaking to the BBC, Mr Oygur said: "I haven't been able to export one pair of boots since 2009. It's terrible. All my customers around the world want Australian-made ugg boots, but Deckers has stopped us from selling worldwide." Deckers has instituted legal proceedings against the Sydney business, calling for punitive damages worth millions of dollars and all funds in Australian Leather's bank accounts be transferred to Deckers. It also wants all of Australian Leather's ugg boot stock to be delivered across the Pacific to Deckers for destruction. Deckers claims uggs were created by Australian surfer Brian Smith, who started making the boots in Santa Monica, California, in 1978. The company declined to talk to the BBC. In a statement, it said that the lawsuit was not directed at sales in Australia, but pertained to Australian Leather's infringement of its registered trademarks in the US. "Deckers is confident in its position and looks forward to presenting its case in court," the statement said. Mr Oygur has flown to America, where he is fighting not only the lawsuit, but also to overturn the original US trademark so he can sell his boots worldwide. "I'm not just doing this for myself. I'm doing this for the Australian boot industry," he said. He claims it costs him A$48 to make a pair of ugg boots, whereas Deckers sells them for A$39. "Some [Deckers] boots are made in China, where I reckon with shipping to Australia it costs just A$30," he said. Australian independent Senator Nick Xenophon has even raised the issue in his nation's parliament. "This is a battle that is worth fighting," he said last year. "The French can protect the use of the word 'champagne', and the Greeks the use of the word 'feta'. So surely Australia can protect the use of the word 'ugg' for Australian small manufacturers." Australia's consumer watchdog ultimately decided not to take action. However, Mr Xenophon has continued to publicise Mr Oygur's case, travelling with him to the US to protest outside Deckers' headquarters last week. University of Adelaide branding expert Dean Wilkie has spent a lifetime studying why consumers choose to buy what he calls "country of origin" products. He told the BBC it's no surprise that Deckers has acted as they have. "What they are doing is trading on what's called 'secondary association', in this case the Aussie lifestyle," he said. "They plaster the boots with Australian images, and give consumers a strong country of origin perspective. It portrays a laid-back, yet positive mood, which in turn puts the buyer in a positive frame of mind to buy." He said very few buyers even look where boots are made. "Even if they do, we are so numb to buying goods made in China, consumers would just block their mind to it,", he said. Mr Wilkie believes that US consumers also think of Australia as a place for holidays, so buying uggs is like buying a souvenir. "However, secondary association can be copied by competitors and then loses its value, so trademarking is a very smart move as it ensures you are the only company in the market," he said. He argues the issue hasn't received much attention in Australia, because uggs are rarely worn in public down under. "They are a bit daggy, and often used as slippers. Most sales of uggs are to tourists," he said. "In the US it is seen as classy, just a little bit different, and a little edgy." Mr Oygur said he has been forced to retrench employees because of the Deckers dispute. "We are just a small firm, trying to make ends meet, by making boots as we always have done," he said. A date for a decision in the legal battle, which is in its final stage, is still to be set.